Personal losses drive a former UI professor to auction items to benefit pediatric cancer research. While sifting through boxes in the office of his Santa Fe, New Mexico, home last October, David Morrell rediscovered an array of valuable books and manuscripts that had first arrived on his doorstep, one by one, more than 35 years ago. The former UI English professor shared the forgotten items with a rare books collector who considered several to be "some of the most expensive pieces of paper from the late 20th century." 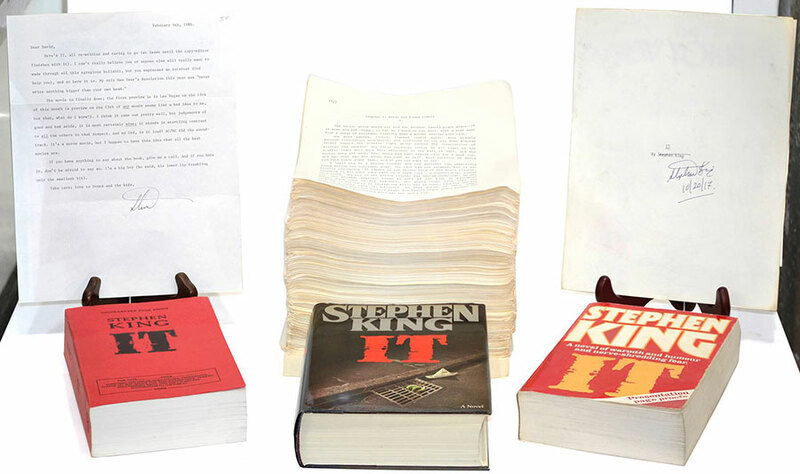 These mementos include early typescripts, limited edition books, and uncorrected proofs signed by Morrell's close friend and one of America's most prolific writers: Stephen King. Though the personal items brought back fond memories, Morrell knew letting them go could have the power to change the lives of kids with cancer. His rare Stephen King collection is being auctioned online with closing dates spread over the next few months. All proceeds will benefit the Matthew Morrell and Natalie Sanchez Pediatric Research Cancer Fund at the University of Iowa. The fund helps a team of researchers at UI Stead Family Children's Hospital, led by medical oncologist and assistant pediatrics professor David Gordon, improve treatments and cures for patients with Ewing sarcoma and the Ewing sarcoma family of tumors. Morrell lost his son, Matthew, at age 15 in 1987 and one of his granddaughters, Natalie, at age 14 in 2009 to complications stemming from Ewing sarcoma, a rare bone disease that afflicts around 200 children in the U.S. each year. "No child should die from cancer," says Gordon. "At the University of Iowa Hospitals and Clinics, our work is focused on identifying innovative treatments for children's cancer while causing less toxicity to patients." Morrell's connection to King began during Morrell's Iowa days after he wrote his critically acclaimed debut novel, First Blood, that introduced the world to action hero John Rambo. King chose the book for a creative writing class he taught in 1979 at the University of Maine and met Morrell's publisher at a 1980 Literary Guild cocktail party, where King agreed to provide an endorsement for the back of Morrell's 1979 novel, The Totem. Soon, a budding friendship between the writers began. The two authors shared their latest projects with one another, sending notes and typescript copies by mail. In 1981, Morrell spent a week at King's Bangor, Maine, home and gave a lecture at the University of Maine. The "King of Horror" returned the favor, visiting Morrell in Iowa City and speaking at the UI. The two took a road trip in 1983 from Rhode Island to Atlantic City, New Jersey. Over the years, Morrell amassed typescript copies for stories such as Misery, It, and The Dark Half, along with numerous published books containing personal inscriptions. King signed the title pages of the typescripts to authenticate each item for the auction, and, in February, Morrell started shipping the items to Gerald Winters, a rare books collector in Maine who is coordinating the auction. In addition to the auction items, Morrell is offering signed first editions of Fireflies: A Father's Tale of Love and Loss—his 1988 memoir about his experience in the cancer ward with his son—to anyone who donates to the Matthew Morrell and Natalie Sanchez Pediatric Research Cancer Fund. "This is a real literary adventure," says Morrell about the future of the King manuscripts. "I hope that some institution will step up and buy these, so they can be studied at a university. That's my wish—from the professor in me." For more on the auction, visit geraldwinters.com/david-morrell-auction.